I always forget to wear green on St. Patrick's Day. It's become a tradition. Because I like being pinched about as much as Lil Kim likes Nicki Minaj, this means I have had years of practice in the art of the creative alternative. This year I'm planning ahead and incorporating the blog (synergy!) with this playlist of songs whose lyrics include the word "green." Oh yeah. Seventeen of them, in fact. For the record, this was not an easy task. 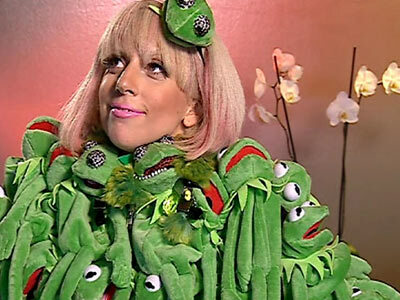 Kermit the Frog was right. 1. Katy Perry feat. Snoop Dogg - "California Gurls"
Warm, wet and wild; there must be something in the water." 2. Jessie and the Toy Boys - "Money Makes the Girl Go Round"
"Bet you'll holler for that dollar! Green is such a pretty color." *Fun fact: this song is supposedly about Florrie, a rival singer and former label-mate from UK pop factory Xenomania, back when she was Jessie Malakouti. 3. Britney Spears - "Heaven on Earth"
They've taken me from far away; one look and you stop time." *Fun fact: "Heaven on Earth" was written by Nicole Morier, and was her big break as a songwriter. She's written with Spears, Wynter Gordon, Hyper Crush, Sky Ferreira and more, and has released her own (smashing) solo material as Coco Morier. 4. Lady Gaga - "Summerboy"
My martini glistens, yeah, while checking out other guys." 5. Alanis Morissette - "Hand in My Pocket"
"I'm free, but I'm focused. I'm hard, but I'm friendly, baby." 6. Beyoncé - "Green Light"
You got the green light. Go go go go go go go go go go go green light!" "Holding up traffic - green means go!" But it's cool for Tom Green to hump a dead moose." 8. No Doubt - "Sixteen"
You're callow and you're green, 'cause you're caught between." 9. Ke$ha - "Who Do You Love?" Gettin' me all pissy 'cause I see you watching..."
Fun fact: Obviously this is from the vast vault of unreleased Ke$ha songs, which is why I've provided it here for you to download. Enjoy! 10. Trey Songz feat. Nicki Minaj - "Bottoms Up"
Girl you know I love the way you shake it in them jeans." 11. Sara Bareilles - "Kaleidoscope Heart"
I have hope - Inside is not a heart but a kaleidoscope." 12. Kelly Rowland feat. Lil Wayne - "Motivation"
I like to taste that sugar; that Sweet-n-Low." 13. P!nk - "Most Girls"
A man that understands real love." 14. Jill Scott - "Womanifesto"
Or out of a money green Phantom comfortably." 15. Miranda Cosgrove - "Disgusting"
It's green and red and stop and go, changing all the time." Fun fact: This was originally written by Ke$ha and was an outtake from Animal. Ke$ha rarely sells her unreleased songs to other artists, but this was an exception. Want to hear Ke$ha's version (it's better, obviously)? Here it is! 16. Lily Allen - "Cheryl Tweedy"
So many things about myself that I despise." Fun fact: This is an unreleased song and I have no idea where I found it, but it's very interesting. Cheryl Tweedy is the maiden name of Girls Aloud singer and ex-X Factor judge Cheryl Cole. 17. Kylie Minogue - "Cruise Control"
Time out - do you know what I mean?" Catch the playlist (minus the two unreleased tracks) on Spotify, and Happy St. Patrick's Day to all!